Welcome to Virginia Water Radio (Episode 20) for the week of June 7, 2010. This week's show is hosted by Alan Raflo, research associate at the Virginia Water Resources Research Center, located at Virginia Tech in Blacksburg. Our show presents news and notices that relate to Virginia’s waters, from the Cumberland Gap to the Atlantic Ocean. In May, the Annapolis, Md., Capital newspaper asked Chesapeake Bay experts for some facts about the Bay that citizens may or may not know. Here are the top 10 that the experts identified. See how many you already know! 1) The Bay’s 64,000-square-mile watershed gives it the largest land-to-water ratio of any estuary in the world. 2) Air pollution generates about one-third of the Bay’s nitrogen inputs. 3) In most communities, storm drains send water directly to streams, not through a wastewater-treatment plant. 4) Everyone who lives, works, or travels in the Bay watershed adds to the Bay’s pollutant load. 5) The latest annual survey estimated that 658 million Blue Crabs live in the Bay. 6) The Susquehanna River is the largest, single source of flow to the Bay. 7) The federal government currently spends about $250 million annually on the Bay. 8) The federal government owns about 5 percent of land in the Bay watershed. 9) The Bay is home to thousands of species of fish, birds, and other animals. And 10) Between 70 and 90 percent of Striped Bass, or Rockfish, along the Atlantic Coast are born in Bay tributaries and return to those tributaries each spring to spawn. News source: 10 things you didn't know about the bay, Annapolis (Md.) Capital, 5/22/10. According to NBC 29 TV in Charlottesville, an April 21 warning letter from the Virginia Department of Environmental Quality, or DEQ, notified Charlottesville that 40 sewage overflow violations occurred between July 2008 and March 2010. The overflows can occur when too much stormwater enters cracks in aging sewer pipes. After the warning letter, the DEQ met with the City to hear of its plans to spend $28 million to repair or replace wastewater infrastructure, and the agency said that it considers the City’s efforts adequate at this point. News sources: Charlottesville receives DEQ warning letter, NBC 29, 5/25/10. According to the Norfolk Virginian-Pilot: On May 27, the Hampton Roads Sanitation District and the Canadian company Ostara dedicated a $5-million facility at the Suffolk wastewater treatment plant that can produce fertilizer from struvite, a material resulting from phosphorus build-up on the plant’s pipes. The Suffolk facility is apparently only the second one in the United States. The process does not remove any additional phosphorus from the wastewater, but it improves plant performance by removing pipe-blocking build-ups, and it makes use of a product that previously has been burned in the plant’s incinerator. The fertilizer generated is being marketed by Ostara as “Crystal Green” in the Hampton Roads area. News source: Suffolk facility to turn sewage into fertilizer is christened, Virginian-Pilot, 5/28/10. More information: The first struvite-to-fertilizer facility opened in 2009 in Oregon. And the last news item this week is our monthly water status report. First, in precipitation: According to the Southeast Regional Climate Center, from May 2nd to 31st precipitation ranged between 2 and 6 inches in most of Virginia, with 6 to 8 inches in some northern and far-southwestern areas. Average precipitation in Virginia in May is between about 3 and 6 inches, depending on one’s location. Second, in stream flow: According to the U.S. Geological Survey’s WaterWatch, streamflows averaged over the month of May were normal at most gaging stations in the Commonwealth, below-normal at some locations in the Holston, James, Shenandoah, and York river basins, and above-normal at some far southwestern locations. And last, our drought watch: The weekly National Drought Monitor on June 1 showed Virginia again being drought-free. About 30 percent of the state was rated as abnormally dry, however, in the May 11th Drought Monitor, but no drought conditions have been indicated for Virginia since the May 18th report. 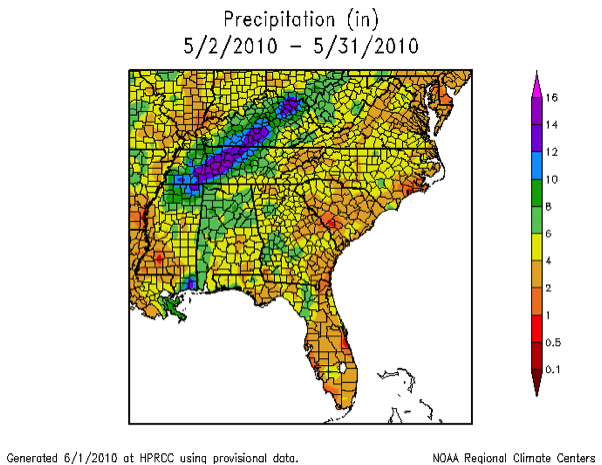 Sources and additional information: Precipitation: Southeast Regional Climate Center precipitation maps, http://www.sercc.com/climateinfo/precip_maps; see below for the two maps used this week. Average precipitation, over the period 1971—2000, is from the National Climatic Data Center, Climatography of the United States No. 81-Virginia, online at http://cdo.ncdc.noaa.gov/climatenormals/clim81/VAnorm.pdf. Streamflow: U.S. Geological Survey WaterWatch for Virginia, http://waterwatch.usgs.gov/?m=mv01d&r=va&w=pa28d%2Cmap; see map and color-code chart below. Drought: The National Drought Monitor map is at http://www.drought.unl.edu/dm/monitor.html. Monthly average streamflow for May 2010, compared to historical records. Tundra Swans breed in the Arctic but spend their winters along the Atlantic, Pacific, and Gulf coasts. In Virginia, the birds are found between November and February around the Chesapeake Bay, on the Eastern Shore, and in Back Bay in Virginia Beach. Thanks to the U.S. Fish and Wildlife Service’s Sound Clips Web site for making this recording available for public use. Information about Tundra Swans and other swans found in Virginia is available online from the Virginia Department of Game and Inland Fisheries Web site, http://www.dgif.virginia.gov/wildlife/swan/descriptions.asp. “Swan Songs,” an article on Tundra Swans by Dotty Holcomb Doherty and published in the Nov. 8-14, 2007, issue of Bay Weekly (Vol. 15, Issue 45), is available online at http://www.bayweekly.com/year07/issuexv45/leadxv45_2.html. Additional source: Birds of North America, St. Martin’s Press, 2001. First, in government policy and regulatory meetings occurring between June 9 and June 16. On June 10, the Mined Land Reclamation Advisory Committee meets in Big Stone Gap. The agenda includes a review of permit issues with the Army Corps of Engineers and the U.S. EPA. For more information, phone Jackie Davis at (276) 523-8282. On June 14, the Waste Management Board meets in Richmond. For more information, phone Debra Miller at (804) 698-4206. On June 16, the Gas and Oil Board meets in Lebanon. For more information, phone David Asbury at (276) 415-9700. Also on June 16, the Board of Conservation and Recreation meets in Richmond. For more information, phone David Dowling at (804) 786-2291. June 15, in Madison, on the TMDL implementation plan for Little Dark Run and the Robinson River in Madison County. For more information, phone Bob Slusser at (540) 351-1590. And June 16, in Carson, on the TMDL study for Hatcher Run in Dinwiddie County and an unnamed tributary to Nebletts Mill Run in Sussex County. For more information, phone Margaret Smigo at (804) 527-5124. On June 12 at Kiptopeke State Park in Northampton County, the Virginia Herpetological Society is holding its 5th Annual “HerpBlitz,” a survey of the amphibians and reptiles in the area. People planning to attend should pre-register by sending an e-mail to frogman31@gmail.com. And on June 25 at Breaks Interstate Park in Dickenson County, the Big Sandy River Basin Coalition is holding the annual Big Sandy River Watershed Conference. For more information, phone Bobbie Rasnick at (276) 926-6621. For more information about government policy and regulatory meetings, click here for the Virginia Regulatory Town Hall, where these meetings are listed by date. For TMDL meetings, click here for the Virginia Department of Environmental Quality TMDL Web site.